I am writing this because the month of April begins the ceremonial rituals for the Mescalero Apache, which are the “coming of age” ceremonies for the girls and the host families. Another activity that is held in April is the Annual Centennial Run which commemorates the Apaches being released as ‘prisoners of war’. There are not very many documented accounts of the Mescalero Apache peoples religious and ceremonial activities. There are however, other resources that were written many years ago from authors to try and gain knowledge or understanding of the ethnography regarding the Apache culture. Many would argue that the information previously written and disseminated by early scholars is outdated, and the approach of observation is subjective. Claire Farrer attempts to bring the Mescalero Apache culture, and its world views to the twenty-first century, and validating the perspectives as legitimate cosmology amongst other Native American cultures and their world views. 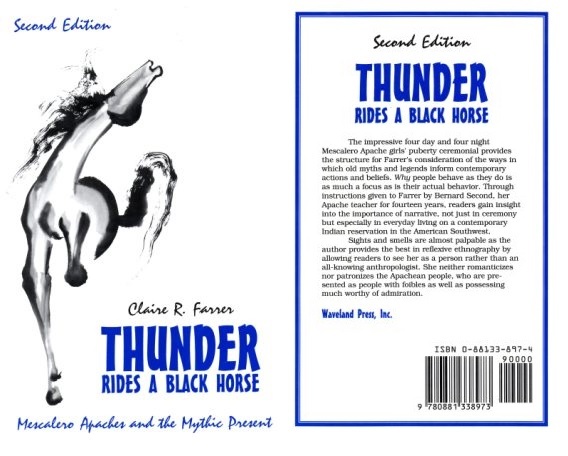 Within her book Thunder Rides a Black Horse, she works with, Bernard Second, a notable medicine men of the tribe, who has directed many of the ceremonies for the Mescalero Apache people. With the assistance of Bernard Second, Farrer is guided through many oral stories of emergence, cosmology, etiquette and purpose for the Kádá’idąą’e’ (the girls coming of age) ceremony known to the Apache culture. There are eight chapters dedicated to the specificity of the ceremony, and a map to the stars for the existence in this important activity, which defines the culture. In the first chapter “Time and the Mythic Present”, Farrer describes her arrival to the Mescalero Apache reservation and meeting Second for the first time. She also begins her field work for her dissertation and is introduced to Bernard’s family and emphasizes the term “fictive kin” in her text. She discusses how this term translates to non-Native culture and her relationship to the Apache people. Farrer develops a relationship and begins to compare, and define the differences in cultural aspect of the Mescalero Apache people. In this chapter she focuses on some of the ritual aspects of the Kádá’idąą’e’ (coming of age ceremony). Farrer also describes the lunar cycles of the moon and the relevancy of its cycle in regards to the girl’s ceremony. The second chapter entitled “Arrive” begins with a brief description of the scenery surrounding the Mescalero Apache reservation. She discusses the creation story or emergence stories of the Apache people which Bernard provided. Bernard introduces the importance of animals and the interaction with animals, because within the oral tradition of storytelling, Second discusses the introduction of plant into the world and its many uses. Second spends some time describing current plants to Farrer and how they are used within the Mescalero Apache culture. One of the important factors within this chapter is the dichotomy which is established between Farrer and the many people she encounters. Because she is an outsider, there is a greater emphasis placed on her and all her amenities and mannerisms, one of them being her dog. Farrer brought her family and her little white poodle with her and many thought it looked like a sheep and often made fun of her small sheep. This made Farrer aware about the good joking that went on the reservation. Another story that is revealed in the second chapter is the story of Tianashka’da / the three who left together. This is a story told by the Apache people about the social behavior of Apache people and how this is reminded in the stars. The story is about two sisters who fell in love with one Apache man. All three had a good relationship throughout their lives and were accepted by all the other people. While they remained together, the band remained happy and prosperous. When they reached old age, the man could not continue on. The medicine man prayed, and sang songs but the man, who was not getting any better. The band had to move camp, but all three and the medicine man remained behind. The man used his final strength to get up, but as he did he began walking towards the horizon. The medicine men tried to stop him and encouraged his rest, but the man insisted. The two women help him walk towards the horizon. As they disappeared, there was a bright light in the sky. At that moment, a set of three stars added to the sky, ‘within the constellation of Taurus’. The three lovers who will always symbolized the balance and prosperity of the Apache people joined together among the starlight in the night sky. Chapter two reveals many of the cultural aspects of the Apache “coming of age” ceremonial, as instructed by Second. Second, being the primary source of information for the ceremonial, outlines his lineage and tribal relationships. There are maps which are drawn by Second, which indicate the layout of the ceremonial grounds and those aspects of ceremonial purpose, such as the Holy lodge. The next map is that of the old grounds, before the new one was built. Chapter two clearly embodies the content of the entire text, conceptually. Focusing on the oral nature of stories and astronomical concepts for the ceremonial rituals. These rituals define how they are incorporated into the ceremonial practices. In chapter three, “On Forming Women”, Farrer begins to explain how Second defines the ceremonial practice, and reasons for the implementation of the ceremonial practices for the girls. The chapter begins when Second wakes with coffee, before the sun rises. This is a time that becomes important for the ceremony. Second explains the preparation for the Sunrise ceremony which will happen later that morning. Another activity which occurs on the ceremonial grounds, away from the preparation of the girls, is the erection of the ceremonial tipi or Holy lodge. These activities are happening simultaneously, as it is all about timing, and the rise of the first light. Second describes in chronological order the erection of the first four poles, which become the structural frame of the lodge. Many people, mostly the men of the host families, assist in the erection of these poles. They first are laid out in the four cardinal directions, and then blessed by the medicine men before they begin to raise the poles. During this chapter, Farrer speaks about the origin story of White Painted Woman or Changing Woman and how this ceremony begins to define the culture and their identity. Each aspect of the first day is depicted in the third chapter. A major aspect to the ceremony is feeding of the people, which the host families are responsible for. Each hosting family must prepare food for the entire tribe and their guests, and anyone who comes to join in the celebrations. In chapter three, Farrer describes the preparation of foods, both traditional Apache foods and modern food types. On the first day, the first meal for the girls consist of traditional style foods, (mescal, mesquite beans, Indian cabbage (yucca bloom petals), and Indian bananas (yucca fruit). There are many people involved in the preparation of the food, which the families will serve all day, breakfast, lunch and dinner. All prepared foods and drink served must be blessed by each of the girls, to ensure the people are participating in the continued balance of life. Chapter two revealed the importance of the ceremonial activities, whereas chapter three reveals more of the preparation activities for these particular ceremonies. There is a conflict stated by Second in the text about the preparation of the mountain dances, with regards to Farrer being a female. Females are not allowed in the area where the mountain spirits are preparing. Second states that the knowledge obtained and retained, is strictly for the males of the tribe. She is given some leniency, due to the research she was conducting. Farrer does not document the mountain dancer’s preparation rituals. She however, gives description of the regalia worn by the deities and the mode of dance. Chapters four ‘ Ko’io/ Go Around!’ and chapters five, I will give you a bow and arrow…a flint knife…I will make a horse for you…” describe the ceremonial etiquette for the third and fourth day. In the fourth chapter, Farrer touches on the issue of alcoholism amongst women on the reservation and how the numbers have risen in succeeding years. Chapter six ‘You are the mother of a people. Let no man speak ill of you.’ concludes the fourth ceremonial day. As indicated in the text Second states the fourth day is the most important day of all. Because the ceremony is coming to a close, and it is important because it will signify the continuation in the balance of life. As in the opening of the ceremony on day one, the process begins the same. Beginning with the night before and the alignment of the Big Dipper (Náhaakus) constellation, the ceremony commences. Singers sing for the girls as they dance late into night as the Big Dipper descends. The upper tip of the Big Dipper vanishes, the girls stop and rest. This is prior to the sunrise. The girls do not sleep but begin the preparations for the transformation into White Painted Woman. As the sun raises many aspect of the camp begins to be dismantled. The girls are lead out to the Holy lodge and the “pulling songs” begin. During this time many of the people can be blessed by medicine men, which represents a new beginning under the blessings of White Painted Woman. Mid morning as the sun peeks, the Holy lodge is slowly taken apart by the men of the families. This time is crucial to the ceremony, as it all has to do with the movement of the sun. At the right time, the girls begin to run, and on the final run, the family begins the ceremonial throw. The community throw consists of everything from candy, beach balls, common household items, which are thrown into the crowd. The girls run and disappear into the horizon and are instructed to run to various places, only known to the girls and the medicine people. Upon their return, the girls are escorted into their specific camps, untouched by anyone and emerge as women & mothers for the people. Chapters Seven and eight conclude the text with some of the dismantling process of the camps and end with personal notes on Farrer’s experience. She concludes her text with the image of the warrior twins (thunder and lightning) riding their respective horses and how the story of the twins continues to define the Mescalero Apache people to this day. On Farrer’s attempt to grasp the concepts of the Mescalero Apache cosmology. She is given credibility because of her efforts. As I stated in the beginning of this review, there are few researchers who have written about the Apache culture, let alone the intricacies of the ceremonial process. Her writing has allowed other to understand the Apache culture, but most of her information boarders on exploitation. Granted this information is important to the schools of anthropology, and ethnography, it however leads to more questions. The route this information should take from here, should be, from a member of the Mescalero Apache Tribe. A doctoral credibility acknowledgement should be retained for tribal individuals who retained this information. 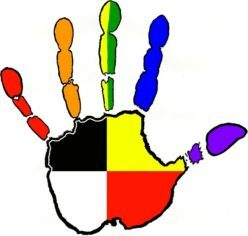 So often, many of the cultural components identifies specific indigenous cultural aspects, which are scrutinized and analyzed in academic institution without regard where the information originates. Farrer attempts to acknowledge and respect the information she has received. She is careful for the nature of information she has obtained and has given proper acknowledgements to the cultural relevancy to cosmology of the Mescalero Apache people. I recommend that many students read this text, as it offers an introduction to the Mescalero Apache culture, which define them as a people. Farrer, Claire, R. Thunder Rides a Black Horse: Mescalero Apache and the Mythic Present. 2nd Long Grove, IL: Waveland Press, Inc.1996. Print. Posted on April 28, 2017 Tags Anthropology, Apache, Benard Second, Ceremony, Claire Farrer, Coming of Age, Cosmology, Crisosto Apache, Medicine man, Memorial runners, Mescalero, Mescalero Apache, Mountain Spirit Dancers, Native American, New Mexico, Spiritual, SpiritualityLeave a comment on The Girls Run: A Review of the Mescalero Apache ‘Coming of Age Ceremony’ and the words written by Claire Farrer & Bernard Second”.